In Japan, festivals occur around the year, and across most regions. From the nostalgic En-nichi, which are street festivals held at shrines, to the most spectacular multi-day matsuri with their countless parades, portable shrines, fireworks and stalls, festivals are a great way to experience Japanese culture. At a festival, you can immerse yourself in tradition, mythology, and have a peek at the wilder side of the normally reserved Japanese. But what do you need to know when planning to attend a festival? How do you ensure you get the most out of your experience? Like any other travel planning, research is key. Most local areas in Japan have their own websites, so if you are planning to visit certain towns or regions, it’s a good idea to look up their sites for schedules of upcoming events and festivals. Another good idea is to look up the websites of Shinto and Buddhist temples, as those will contain schedules for En-nichi and local festivals. If you are in Japan and you know the language, look out for announcements in the local newspapers and community notice boards. On the other hand, if you are hoping to plan your travel to coincide with a festival, there are many websites that provide schedules of festivals around Japan. Refer to the list of sites at the end of this article. We have also provided a handy guide to some of the best festivals around the year. – information for people who may be planning to participate in the parades, including dress codesand procedures. Using this information, you can plan your visit around “must-see” events, locations of interest, andschedule rest periods. Some festivals like the Aomori Nebuta Festival have prepaid seats that can be booked well in advance, which can guarantee a good viewing spot without all the fuss. During your preparations, you should make sure you have packed enough cash for the day. Most attractions at the festivals run on a cash- only basis, including the food stalls. it allows you to avoid the crowds and queues at the street stalls. That said, if you value the experience of getting traditional festival food from the stalls, you should budget your time and money accordingly. In terms of clothing, most Japanese go to festivals in their regular clothes, which means T-shirt and shorts in the summer when most festivals are held. Of course, you can opt to wear a yukata or kimono, but make sure that your clothes and footwear will be comfortable in a crowd and for spending long periods of time on your feet. Many Japanese festivals will have mikoshi (portable shrine) parades that are considered must-sees. Some of the parades have unique aspects (such as the massive floats of the Gion Matsuri) which you definitely will not want to miss. Some festivals have parades during the day and night. While the day-time parades tend to be quite exciting, make sure to stay for the night parades, which are a visual spectacle with lanterns, lights and fireworks. dancing. But be aware that you may need to buy or rent the appropriate costumes to participate. There are also safety rules around participating in parades, such as not going against the flow of the march. Make sure you check the festival website or with the person in charge regarding the rules. Make sure to plan ahead and give yourself enough time to secure a good viewing spot for the fireworks at the designated viewing areas. Chairs are generally not allowed, but most locals use tarps or picnic blankets. You should also expect large crowds and lines atthe train stations, so use a Japan Rail Pass, PASMO or Suica prepaid card to skip the ticket lines. The common sense rules in crowded areas apply to festivals. Keep your belongs to a minimum, and if you are in a group, have a planned meeting location if you get separated, or a way to contact each other. Most festivals take place during summer in the months of July and August. But there are events throughout the year. Make sure to check their exact dates when planning your visit. closest to 15 May Kanda Matsuri Tokyo One of the three largest Japanese holidays. Thousands of people parade through central Tokyo with portable shrines and decorated horses. June Sanno Matsuri Tokyo Locals in traditional Japanese clothing parade through Tokyo holding portable shrines, drums and horses. July Mitama Matsuri Yasukuni Shrine, Chiyoda, Tokyo The area around Yasukuni Shrine is lit up by about 20,000 lanterns. 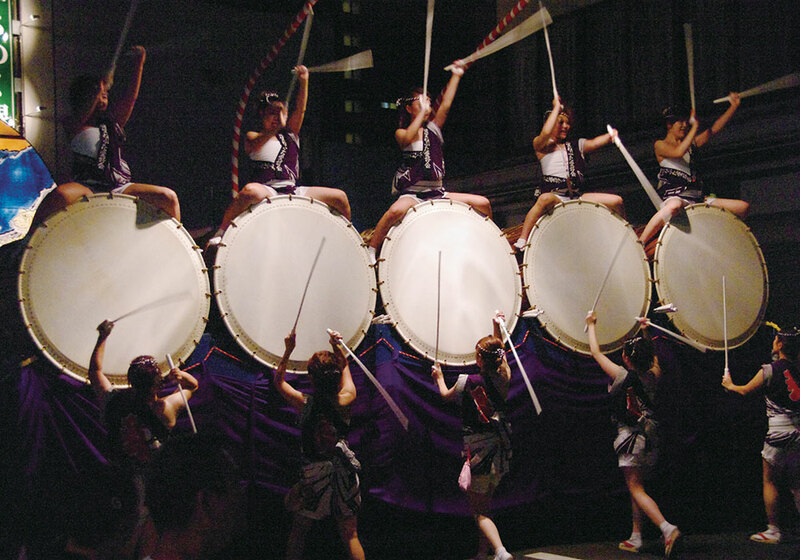 Events include a float procession, traditional dancing, theatre and koto shows. Stalls in the main alley sell traditional food, and visitors to the festival come dressed in yukata. July Gion Matsuri Yasaka Shrine, Kyoto The roads at the centre of Kyoto are barricaded off to allow food and games stands to be set up. The procession which starts at the Yasaka Shrine features some 30 floats that reach 25m high, and weigh as much as 12 tonnes. July Ohatsu Tenji Natsu Matsuri Tenmangu Shrine, Osaka A mikoshi parade, with participants dressed in the style of the 8th to 12th century imperial court, accompanied by a river parade of 100 traditional boats, which light fires in the evening to go with fireworks. July-August Ueno Natsu Matsuri Ueno Park, Tokyo A microcosm of all the summer festivals in Japan. Every day of the festival is different. 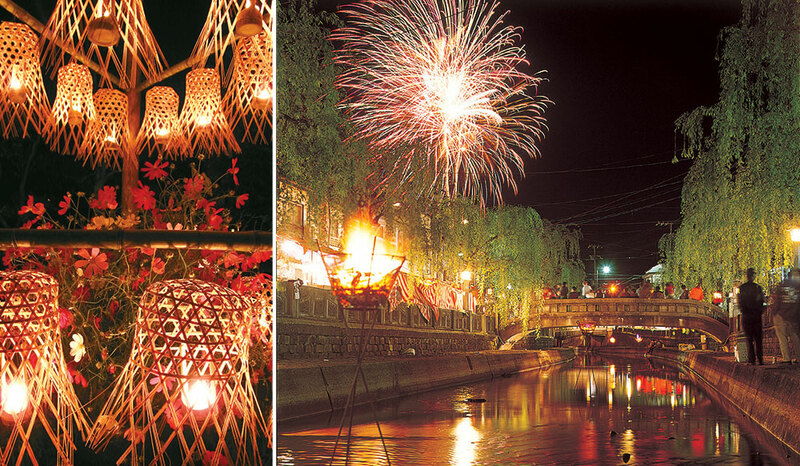 A giant parade takes place on 19 July, and in the evening Lake Shinobazu is a stunning scene with floating lanterns. August Gozan no Okuribi festival Kyoto On the day of the festival, giant bonfires are lit on mountains surrounding Kyoto from 8pm on. These fires are arranged in the form of characters and motifs and are each lit for 30 minutes. There are designated viewing spots for each cluster of bonfires..
August Aomori Nebuta Matsuri Aomori City Predominantly a night festival. The parade starts at sunset and runs for a few hours. Dancers carry the illuminated and decorated floats. On the last day, the parade starts at midday, and runs into the night, when the floats are set out to sea and fireworks are lit. August Awa Odori Matsuri Tokushima in Shikoku region Dancers dressed in yukata and straw hats walk and dance through the streets of the city, accompanied by sdhamisen, drums, flutes and brass. Visitors can join the Niwaka Ren (drop-in team) and dance without advanced application or fee. They can also opt to get lessons from experts before going to the venue. October Oeshiki Festival Hommonji Temple, Tokyo On the evening of the 12th there is a parade with lights fixed on tall poles. Followers chant and pray to the unique tunes of drums and flutes. November Taimatsu Akashi Sukagawa, Fukushima Features giant Taimatsu (fire torches) reaching 10m high and up to 3 tonnes. The Taimatsu are carried at the head of a procession of samurai and royal courtiers which parades to Mt. Gorosan. Once the sun goes down, people climb the giant Taimatsu without the use of ladders, to ignite the “sacred fire” at the top by hand. After the giant Taimatsu is lit, the 30 other Taimatsu are ignited one after another, until the surrounding area literally becomes a sea of fire.